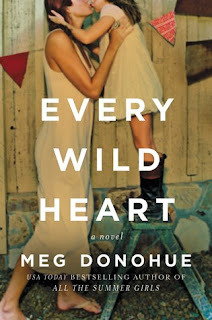 Every Wild Heart by Meg Donohue is a recommended mother/daughter story. Gail Gideon is the radio personality/voice for "The Gail Gideon Show." Gail's show began as an on-air rant nine years ago when her husband asked for a divorce. Now her nationally syndicated show provides advice to millions of women who seek self-empowerment. Her fame has come at a price, including stalkers, misguided fans, callers who dislike her, and harassing notes. But Gail has kept a low profile and most people don't know what she looks like. Gail's daughter Nic, 14, has always had self-esteem issues and a problem with stuttering. She tends to avoid social situations and much prefers her time after school at the stables with her horse, Tru. Then the unthinkable happens and a riding accident sends Nic to the hospital with a traumatic brain injury. When she comes out of her coma, she is a changed girl. She is now much more confident, charming, outspoken, and her stutter is gone. She's now emboldened to talk to new senior, Lucas Holt, but she is also making other decisions that are more reckless. Gail notices the change in her daughter and wants to protect her, but needs to balance her concern with other commitments. Nic definitely can't ride her horse until it is approved by the doctors and her mom and dad. Will Nic listen to her mom when riding is her true love, unless Lucas is going to take that role. And what about Gail? Can she really give advice to single women when she might be falling for someone? This novel is set with a sound track because Gail loves her music and has a song or two or three for every scene and event in her life. Music is a central theme in this story, so know your female singers when you start reading. Every Wild Heart encompasses a light mystery, love stories, the mother-daughter bond, horses, and music. The novel is well-written and flows smoothly as the chapters switch between the point of view of Gail and Nic. The dual narration is very successful here and offers a nice point-counterpoint between the two as the various storylines in the plot are developed. Even though the novel is a little too-sweet and predictable at times, it is well-written and offers a pleasant diversion from life. Every now and then it is nice to read a novel with conflicts that all find a resolution and a happy ending. Disclosure: My review copy was courtesy of HarperCollins. All posts at She Treads Softly are the property of Lori N. Lutes. Any use of original material posted here, whether in full or in part, must be properly attributed. Please feel free to contact me if you have any questions. Please read this first if you are interested in offering me a review copy of a book. A "stuck overnight at the airport book" means this book will keep you up, awake, and entertained with minimum trips to find coffee or a distraction. An "airplane book" rating means it is an engaging book that will hold your attention but you won't cry if you lose it or misplace it. 1. Try to understand what the author wished to do, and do not blame him for not achieving what he did not attempt. 2. Give him enough direct quotation--at least one extended passage--of the book's prose so the review's reader can form his own impression, can get his own taste. 3. Confirm your description of the book with quotation from the book, if only phrase-long, rather than proceeding by fuzzy precis. 4. Go easy on plot summary, and do not give away the ending. 5. If the book is judged deficient, cite a successful example along the same lines, from the author's oeuvre or elsewhere. Try to understand the failure. Sure it's his and not yours? To these concrete five might be added a vaguer sixth, having to do with maintaining a chemical purity in the reaction between product and appraiser.....Review the book, not the reputation.... Better to praise and share than blame and ban. The communion between reviewer and his public is based upon the presumption of certain possible joys in reading, and all our discriminations should curve toward that end. The story itself, the true story, is the one that the audience members create in their minds, guided and shaped by my text, but then transformed, elucidated, expanded, edited, and clarified by their own experience, their own desires, their own hopes and fears. Tread softly because you tread on my dreams.